TV newsman Walter Cronkite was known as The Most Trusted Man in America. If he told you something on the six o’clock news, you knew it was 100% true and reliable. Is there anyone on TV now who has earned that label? How about in newspaper publishing or in the online world? How about on Facebook? Think, that’s going a bit too far? Not so, says the American public. 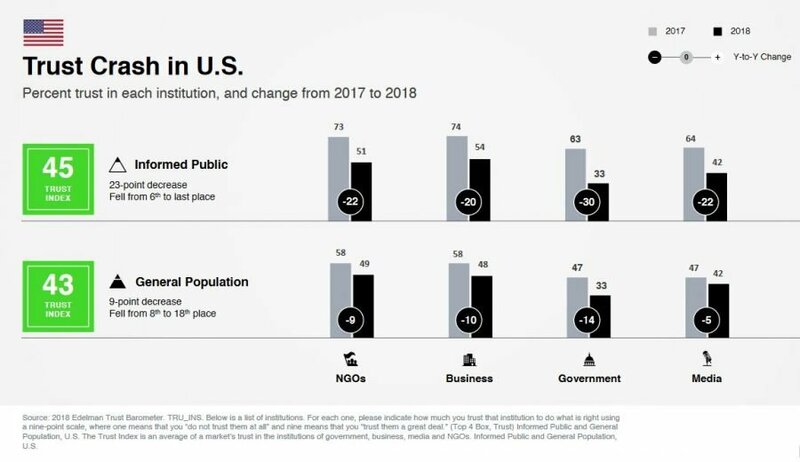 According to the new 2018 Edelman Trust Barometer, Americans include search engines, social platforms and even influencers to be part of “the media” and their trust in said “media” is on the decline. One big issue is the spreading of fake news. 7 out of 10 people surveyed thought that the spread of false information could be harmful. More than half said they think that the major news outlets – the ones we used to trust unconditionally – are now more concerned about pushing their own agenda and attracting a larger audience than accurately reporting the news. 65% also thought that news outlets were willing to sacrifice accuracy in order to be the first with breaking news. To make matters worse, 60% said they have a hard time figuring out if a news story was produced by a legitimate news agency and they had no method of gauging fact from speculation. Even so, trust in individual journalists rose 5% in the last year, but trust in platforms (including social media) dipped to a near all-time low. This is rough because 65% of people said they get their news from social media feeds and news aggregators such as the ones you see when you open a new browser page. You know what I get when I open a new tab? Half a dozen stories about the Olympics, several stories about a tragedy that occurred earlier today, and sandwiched in between is a story called “Here’s why guys are obsessed with this underwear”. And they wonder why people don’t trust the media anymore. If you think your business is in the clear because it’s not a media company, don’t sigh with relief just yet. Edelman asked the respondents if there were consequences to this lack of trust in the media. 56% said that this lack of trust in media has led to a loss of trust in the government leaders. 42% said they’re left wondering which companies or brands they should trust. Yadda Yadda news writes a story about safety issue inside The Doda Doda Company. No problem, you give your business to Doda’s competitor. Done deal. Until you find out that the competitor who got your business and Yadda Yadda news are owned by the same parent company. Now do you believe their story? A celebrity influencer posts an Instagram saying pink lipstick causes cancer. Totally, untrue of course, but you can bet that sales of pink lipstick are going to drop because better safe than sorry. How do you combat consumer mistrust? Start with the right spokesperson. The Edelman survey shows that Technical Experts are the most trusted speakers, followed closely by Academic Experts. If you’re an entrepreneur – good for you. People trust a successful entrepreneur more than they trust the CEO of a large company. Whatever you do, don’t ask a Government Employee to speak on your behalf, because they’re the least trusted of all. The only entity that lost ground in 2018 is the average Joe. That’s right, fewer people said they trust the word of a “person like yourself”. And that’s very sad. Next step is to prove to the public that you’re worthy of their trust. In the US, that means safeguarding privacy, investing in consumer safety, driving economic prosperity and being an innovator in your field. Fake news and skewed reporting aren’t going away anytime soon. The best you can do to combat it is making sure that everything you’re putting out is honest, fact-checked, and transparent. That way, if your industry does come under attack, your customers will be willing to listen to your side of the story before deciding what’s true and what’s false. Are you guilty of buying your Twitter followers? There’s a purge coming! Richard Roeper, the film critic for the Chicago Sun-Times was suspended for what – to most people – will sound like a very strange, and inconsequential reason: he has too many phony followers on Twitter. Sound like a weird reason to ban a man from the good work he’s been doing for years? The trouble started when The New York Times published an expose about influencers and fake Twitter followers. We’ve always known that Twitter is full of fake and dead accounts. Previous studies have shown that 50 to 90% of followers on influencer accounts are phony. And yet, everyone is thrashing about this week as if the New York Times reveal was new news. What the Times did do, that was new news, was deliver concrete numbers along with the name of a company who has made an exceptionally good living out of selling phony followers to celebs and large companies. Or, more accurately, selling them to social media managers who either didn’t know better or felt pressured to do so. I’ve spent many years working as a social media manager and the pressure to deliver is real. There’s a high expectation that a best-selling author, or a beloved actor will have millions of followers, even if they only opened their Twitter account a week ago. I have first-hand knowledge of publishers who said they wouldn’t publish a book if an author didn’t have a large number of followers. I know of startups who needed to inflate numbers to attract investors. And if you’re looking to pay an influencer to hawk your product, the higher the follower count, the more they can charge. That’s where this goes from an unethical move to full-on fraud. If you’re charging Big Brand X dollars to put their product in front of 30,000 people and 20,000 of them are fake and you know it, that’s fraud. Where it gets tricky is the “you know it” part. If you bought followers, then you know it or you’re extremely naïve. I take that back. I’ve heard very intelligent people swear to me that the company they’re buying from is TOTALLY legit. Maybe they just want to believe it because it’s better than admitting your cool company only has 1,000 followers. Even if we take the money out of the story, there’s a bigger issue: trust. If politicians and journalists have padded their accounts with fake followers, can we trust anything they say? Am I supposed to believe that these potato chips are the best tasting chips, if the blogger who says it is lying about their numbers? On the other hand, how many celebrity Tweeters run their own accounts? How many actually knew that their publicist or social media manager was padding the rolls? The New York Times says that in the past week, over a million followers have disappeared from influencer accounts. Accounts owned by prominent people who clearly got nervous after the original article named names. Think an agency has padded your Twitter follower numbers? Perhaps you once bought a large following, but now have buyer’s remorse? It’s time to check your own accounts. Note that the only way to stop a phony follower from following you is to block them. There are some tools on the market who claim they can identify fakes and block them in bulk. If you’re looking at blocking more than 1,000 accounts, that’s the only way. As you dig through the list, you’ll also find a large number of accounts that haven’t been used for years. People quit Twitter. They make multiple accounts then can’t keep them up. Those followers aren’t doing you any good but they’re not doing you any harm. What you’re looking for are the true fakes that were set up purely to line someone’s pocket. It’s pretty easy to tell. The company’s that create these accounts don’t put much effort into making them look legit. 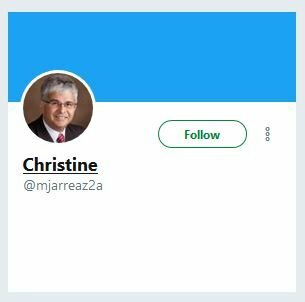 Some tell-tale signs include bios that don’t makes sense, bios / names / images that don’t match up, no header, nothing but reTweets in their feed. If you look at a few fake accounts in a row, you’ll see that they all have the same spammy reTweets – a good sign that the fakes all came from the same bogus operator. A large number of followers may make you feel like you’re conquering the social media marketing monster, but ask yourself this: how many of those followers are actually buying what you’re selling? In the end, reaching one potential buyer on Twitter is a better use of your time than blasting content out to 1,000 people who don’t even exist. Andy’s 2 cents: When working with Twitter influencers, it’s all about that, influence. It doesn’t matter if they have 200k followers if they can’t get more than a couple of clicks or retweets. Be diligent in researching their actual engagement and influence of your target audience. Better to reach just 1000 people, if they’re the right people. The White Moose Cafe vs the Vlogger – who won? Earlier this week, a YouTube Vlogger (as in video blogger) and the owner of a hotel in Ireland got into a public row that polarized both the blogging community and business owners around the world. Okay, that’s a bit overly dramatic but so is this whole fight over freebies, entitlement and public shaming. 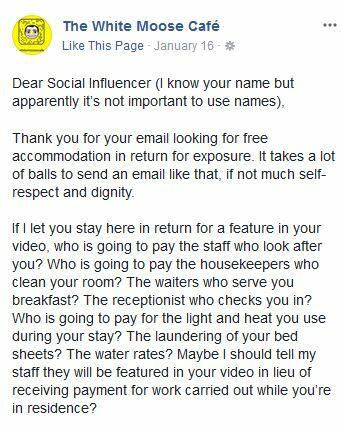 It began when a YouTuber with a pretty decent following, wrote to a hotel in Ireland asking for a free room over Valentine’s Day weekend in return for a review on her channel. As a writer whose been on both sides of the ask, I don’t think her request was out of line. It was polite. She explains the size of her following and notes that she’s done this before with great success. No harm in asking, right? Except in this case, she asked a man who regularly writes angry blog posts about life, other companies and websites that review hotels (such language!). In the bloggers defense, she probably didn’t visit the owners blog before writing him. She probably sent out dozens of these emails to every hotel in her vacation zone. She was just unlucky enough to hit one with a hair trigger. The story went viral and rather than stepping back, the owner then sent the blogger a bill for $6.5 million dollars which he claims is the value of all the publicity she’s received thanks to him. Her YouTube numbers have climbed significantly, and I’ll bet there are hotels begging her to come and stay with them for the holiday, so he might be right about the value of the ban. And since the hotel owner is a true entrepreneur, he’s now created a line of t-shirts that say “I demanded a freebie at the White Moose Café and all I got was this lousy T-shirt”. Pretty clever that he’s using an incident involving a hotel to gain publicity for his café, don’t you think? The hotel/café owner has received his fair share of hate posts from bloggers and lovers of common decency but he seems more than happy to take it on the chin, while the vlogger is ready to put this whole incident to bed – king size with high-quality sheets and a chocolate on the pillow. Ironically and possibly intentionally, the feud seems to have done more good than harm for both parties. It does make you wonder if some of this public fight wasn’t engineered to be the popcorn drama that the internet thrives on. What do you think? The shortest distance between an unhappy airline passenger and the airline is social media. You’ve got a problem and you’re stuck on a plane or in an airport terminal. Your cell phone battery is dying and the WiFi is lousy. Instead of wasting time trying to find a customer service phone number online (forget email – that just results in an auto ‘we’ll get to you as soon as we can’ response), you open Twitter and begin to type. Within seconds, you have the airline’s Twitter handle and a few seconds after that, your complaint has been logged. Social media is the simplest, and fastest, way to get the attention of a customer service attendant and as a bonus, it’s the easiest way to publicly shame a company into taking action. Airlines don’t like it because it’s hard to solve a problem in short bursts with an unidentified, angry consumer, but 43% of airlines say they’re making customer service via social media a priority in 2018. Surprisingly, Twitter says there’s an upside to public customer complaints. They say that a “resolved negative tweet leads to 3x more revenue potential than a positive tweet.” Maybe so, but it still hurts. Especially if you don’t answer right away. 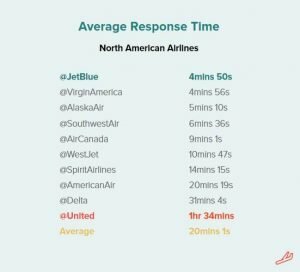 According to a recent study by Conversocial, every major US airline – except one – has their Twitter response time down to under an hour. The problem child? United, who came in at an average of 1 min and 34 minutes. Makes me wonder if it’s a question of too few customer service reps or too many complaints? The big winners are JetBlue and Virgin who both came in under the 5 minute mark. In other words, a quick response time won’t help your brand’s reputation if your people don’t have the tools and the power to actually solve problems as they arise. Simply replying, “I hear you” isn’t enough. Travel is stressful, so anything that upsets the tray-table can get magnified 100%. Think you’ve got Twitter handled? 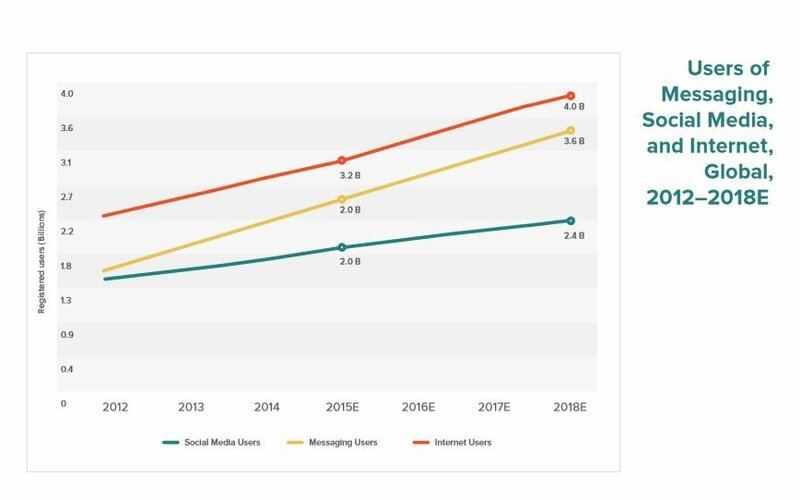 Great, Conversocial says customers are moving on to direct messaging through Facebook and other messenger services. Over a period of six months, Facebook Messenger contacts for Conversocial’s airline partners more than doubled. They also noted a 50% increase in Twitter Direct Messages. The good news here is that direct messaging is private (no more public shaming) and it’s easier to keep track of a conversation on messenger than in a series of Tweets. Messenger apps also allow customer service reps to safely gather needed personal information and follow up later to make sure the customer was completely satisfied. The downside is that this is yet another channel to monitor. Try telling a customer you missed their Facebook message because your team was over on Twitter and see how well that goes over. Chances are, those of you reading this, aren’t running an airline. But you are running some kind of business and businesses need happy customers. If you’re small, monitoring a dozen social channels for customer service complaints is tough but there are tools that can help with that. It’s nice to think that customers hold airlines to a higher standard, but it’s simply not true. No one wants to wait more than an hour for a response to a problem. Doesn’t matter if it’s about a $1,000 airline ticket or a $3 box of crackers. In order to protect your brand’s reputation, make a regular sweep of all your social media channels including comments and private messages. Respond to every issue as soon as you find it, even if you have to do more research to solve the problem. And when possible, please don’t respond to a complaint by asking the customer to email customer service. That’s easier for you, but it’s another roadblock for them and you don’t want to go there. Above all, be honest about what you can and can’t do. Yes, faster is better, but if it’s going to take three days to fix the problem, say so and be sure to follow up on that third day. As long as the customer feels that you’re actively trying to make things better, they’ll hang on. The longer the process takes, the more you should consider sweetening the deal with a discount, refund or gift. It’s 5 o’clock on the day before a huge holiday weekend. You have just enough time to get home and pack before catching the red-eye. Then it’s 4 long days of family, food and hopefully fun. All great, except for that one little thing chewing on the back of your brain. The feeling that you forgot to do something important before sliding into holiday vacation mode. What could it be. . . . . ? Oh yeah. That was it. 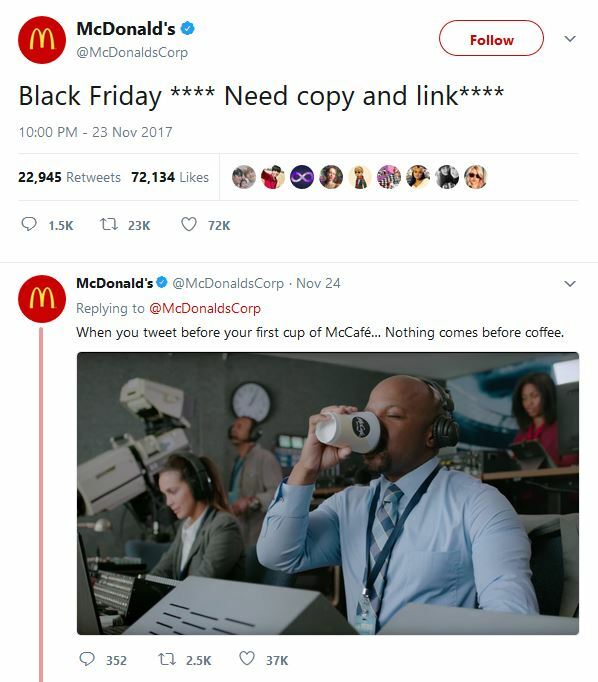 Someone on the McDonalds social media team had a very bad Black Friday. Hopefully, they didn’t start the holiday season with a pink slip because, come on, it’s an easy mistake. And it’s not like they accidentally moved the decimal point on the big screen TV prices. And it’s not like anyone was paying attention to the McDonalds Twitter account on the biggest shopping day of the year. . . . This isn’t the first time the square burger joint used their Twitter account as a pointy stick with which to jab competitors. Earlier this year, Wendy’s piled on when McDonalds Tweeted that they were going to start using “fresh beef” in the Quarter Pounders in the “majority” of their restaurants. Wendy’s – along with the rest of us – wondered what that meant for the rest of the menu in ALL of their restaurants. 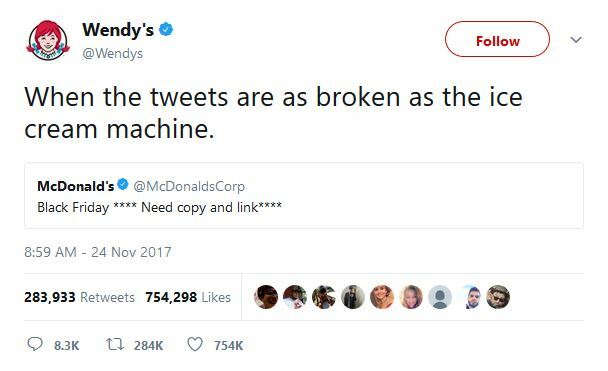 These cleverly crafted quips (with even more clever follow-ups) make it seem like Wendy’s is winning the war of words, but are they? Is pointing out the mistakes of the competition, even in a humorous way, a good idea? Making fun of the enemy when he’s down could backfire. It could make the responding company look like a bully, especially when it’s such a strong response to a harmless, and understandable mistake. Forgetting to fill in the holiday Tweet was embarrassing, and the person responsible likely took some heat. But it’s harder for the management to forgive and forget when the competitor turns that simple mistake into a viral news story. So what effect did this exchange have on the two fast food chains? As of today, the McDonalds Tweet has been shared 23,000 times and has 72K likes. That’s no where near the 283,000 retweets and 754,000 likes that the Wendy’s reply Tweet received. On views alone, Wendy’s is the winner. Still, both companies got quite a bit of press which included links to both Twitter accounts. Sure, McDonalds comes off looking like a clown, but how many people were saying their name and viewing their feed that wouldn’t have done so otherwise? How many people ate lunch at McDonalds last weekend because they had the brand on the brain? Wendy’s is lucky that reply slid in under the grill. It’s one thing to poke fun at the competition but insulting individuals (even trolls) is never a good idea. In the end, McDonalds took the high road and blamed the mistake on a lack of coffee – or more accurately – a McCafe. Time for the big question: is it okay to Tweet sarcastic jokes when your competitor makes a mistake? That depends largely on your audience and the severity of the situation. If your company has a young, trend-loving audience (Wendy’s, Taco Bell, Old Spice, DiGiorno Pizza) you can get away as long as the infraction isn’t serious. A badly written Tweet is fine, but if the mistakes involves people getting hurt, leave it alone. If your audience is more traditional or you’re in a more serious industry, don’t even think about emulating Wendy’s. Jabs from one fast food slinger to another is funny but no one wants to see bankers, doctors or lawyers making jokes out of a competitor’s mistake.